My daughter was working on a school project that entailed building a shelter inspired by a Native American structure. I suggested we check out the longhouse at the 1719 Hans Herr House & Museum. While I was aware Lancaster was once home to Native American tribes, I was amazed at how much I learned about native culture through taking the tour that is offered. The 1719 Hans Herr House & Museum in Willow Street is a prime example of Lancaster’s rich history. It’s not only the oldest-standing house in Lancaster County, but it’s also the oldest original Mennonite meeting house in the Western Hemisphere. From April through November – except on Sundays, of course – thousands visit the museum, where they hear tales of the earliest colonists in our area, notably of the nine Mennonite men and their families, who had been granted land near Pequea Creek. The group traveled to the area in 1710, using an ancient native path known as the “Great Conestoga Trail,” which was the earliest-known path from Philadelphia to Conestoga (a center of trade and commerce at that time). A cornerstone of William Penn’s vision for Pennsylvania was religious freedom, which is what brought many Quakers and Mennonites to the area. Lesser known is that he also maintained Native Americans should be fairly compensated for their land, despite having been granted the land himself by King Charles II for repayment of a debt to his father. For decades, Native Americans, Mennonites and Quakers lived under Penn’s peace treaties as neighbors, traders and fellow Christians. Long before the arrival of Europeans, tribal people known as the Shenks Ferry, Conoy, Lenape, Susquehannock, Conestogas and many others resided in Lancaster County. They made their homes in longhouses, which, in this area, took the shape of long, narrow structures that featured curved walls and roofs made from bark that was stretched over a framework of saplings. As the tribal people disappeared, so did the longhouses. 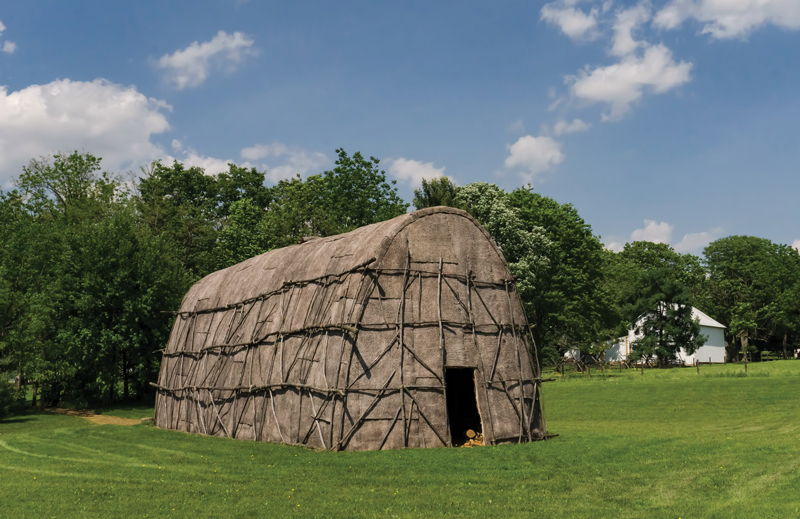 However, thanks to the efforts of the 1719 Hans Herr House & Museum, the Lancaster Mennonite Historical Society, the Circle Legacy Center and local residents who revere their native ancestry, Lancaster is once again home to a longhouse. The Lancaster Longhouse, which was built on the grounds of the 1719 Hans Herr House & Museum in 2013 and is among the few that exist in the United States, provides visitors with an authentic look back at the peaceful times – circa 1570-1770 – that existed between the native groups and the settlers. Its design replicates a longhouse that was excavated in Washington Boro in 1969. While some synthetic materials were used to protect it against inclement weather, the structure itself was constructed using traditional means of lashing. It is filled with artisan artifacts that were produced to be authentic to the tools and crafts used by local native peoples before and after European contact. The opening of the longhouse exhibit coincided with a significant historical event that occurred 250 years earlier. On December 14, 1763, a vigilante group of Scots-Irish frontiersmen known as the Paxton Boys raided a village and killed approximately six members of the Conestoga tribe. The remaining 14 tribe members were given protective custody in the Lancaster City jailhouse (located where the Fulton Theatre stands today). Despite the measures that were taken, the Paxton Boys broke into the jail on December 27 and violently murdered the remaining members of the Conestoga tribe. While only a few natives still resided in the area, the Conestoga Massacre effectively ended native tribal life in Lancaster County and is considered the final blow in dividing relations between natives and colonists. The 1719 Hans Herr House & Museum is located at 1849 Hans Herr Drive in Willow Street. For details, call 717-464-4438 or visit hansherr.org. Well said, Mr. Dochter. Both the Hans Herr House and the replica Longhouse are well worth a visit.